“Our name is Mike and Carol Wordekemper. 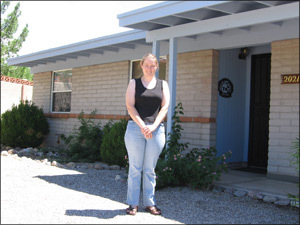 We would like to tell you how happy we have been with Lisa during our buying of our home in Tucson. We are from Iowa and we met Lisa at the end of February when she showed us a home while we were vacationing. We came back to Iowa and put our house on the market, it sold and we put an offer on the home in Tucson. She has been there every step of the way and has went above and beyond helping us with this process. Since we have not been there she has spent a lot of time going to the home for various reasons; i.e. Inspection, repairs, plumbing, appraisal. I had a great first time home buying experience. The Marsee Wilhems Group staff was knowledgeable, friendly and honest. They guided me through the whole process from start to finish, and could answer all my questions – which was a lot from some one who knew nothing about buying a house. If you are a seller in this challenging market, there is ONLY one realtor you need to call – Marsee. Where other companies representing us failed, Marsee closed our sale with multiple offers! We would recommend Marsee highly to any seller and, like us, you’ll soon be packing! with Marsee and would definitely recommend her! within 2 weeks, we were able to find a place and finally move in. We would like to thank everyone for their hard work. All of you did a great job. I have recommended your company to friends for the selling of their home and the purchasing of a new one. The best of luck to you and everyone else at EXP Realty. Thank you for a job well done. After my first 3-month listing contract expired with another agency, I decided to contact Marsee Wilhems. My impetus was seeing her ‘For Sale’signs around town – often enough to remember the name. And more poignantly,those same signs with the word “SOLD” attached. The Marsee Wilhems agency sold my house a mere 22 days after I signed with them. And in a market where real estate values routinely drop 3-6% per month, length of time on the market is a critical factor. My experience with the Marsee Wilhems agency was wholly unlike that which I had with my first agency. Marsee’s people are notably congenial and unwaveringly professional – and follow an obviously well rehearsed and thoroughly tested set of protocols. Essentially, I was politely ushered through a set of simple steps, such as filling out forms and reviewing home selling information, right up until the day my house sold. If I had a question, the answer was expeditiously forthcoming, and invariably accurate and easy to understand. It is not my custom to pen endorsements to be used for referrals. In this instance I am making an exception. This exception, however, is not prompted by any sense of devotion to the Marsee Wilhems agency for doing their job efficiently. For that, they have been remunerated. Rather, my incentive is to try to help others who are trying to sell their home in this less than optimum real estate market. Had I remained with my first, less costly agency for another 3 months, my home would have substantially depreciated vis-à-vis the rapidly declining market. Perhaps this brief missive will be of benefit others in my position – those who need to sell their home before its value declines so substantially that sale becomes impractical. Buying the home of our dreams became a reality today thanks to you and your great staff. Not only did we save over $8,000 on the price of the home but Jeff gave us an incredible deal on our mortgage rate as well. I feel sorry for your competition, you guys are going to make it very difficult for them to compete against your service. Please feel free to use me as a reference anytime. We would like to Thank Marsee for selling our home in thirty days! True to her word, Marsee purchased our Buyer’s home in order for this transaction to take place. The gift basket was awesome! Thanks for all your help Marsee & Associates! I am writing this in appreciation for the sale of my house. It went so quickly and smoothly that I am still in awe. I previously owned four houses and this sale was head and shoulders above those experiences. This team is wonderful. Every question or concern, no matter how small, was answered immediately. The paperwork was kept at a minimum. And all dates were kept within the time frame we has agreed upon. Iam sending my heartfelt thanks and gratitude for making the selling of my house a wonderful experience. Lowell and I wanted to THANK YOU for all your hard work and effort in relation to the sale of our house, you all worked very hard on our behalf and we enjoyed our home selling experience. Whether it was the marketing of our home, your informative web site, or keeping us posted with what was going on, we are pleased with the end result working with the Marsee Wilhems Group. There were approximately 12 homes for sale in our neighborhood at the time you listed our house, some of them being on the market for a long time, you sold our house for what we asked and in just a three-week period. We wanted you to represent us in the sale of our home as we saw how professionally and quickly you handled the sale of our neighbor’s house. The FOR SALE sign that you posted in our yard was very informative with a lot of options for buyers to take advantage of such as virtual tour, web-site, phone numbers, and fliers. We are very happy we used the Marsee Wilhems group to sell our home and we will call you in the future for our home buying or selling needs. Best Regards and continued success in your business! We just wanted to thank you for all you did for us. This was a great experience and we are happy with the service we received. We will definitely be using the Marsee Wilhems Group in the future. Thanks again! Take care. On July 18 we signed with you to sell our home. August 31 we have the closing on our home. We call that Great!! Everyone was very friendly and made us feel comfortable. We will recommend you for sure. I want to thank Marsee and her staff for the wonderful experience while selling my house. It was my first time and everyone at The Marsee Wilhems Group made me feel comfortable, relaxed and like I was their only customer. Thank you all for your help and patience. Thank you, also, for selling my home fast and at the perfect price.